The Ouija game as we know it was first patented in 1891 as a novelty item. Hasbro owns and produces the game today, and it remains one of the most popular party games. The Ouija board is known as a talking board. There are many different varieties of talking boards, but they all work the same way. Two or more people place fingers on a planchette and attempt to communicate with “the other side” by asking questions. If the spirits like you, they may even answer back. First and foremost, the Ouija game is just a game. It is still controversial today because it stems from a genuine spiritual and religious tool. 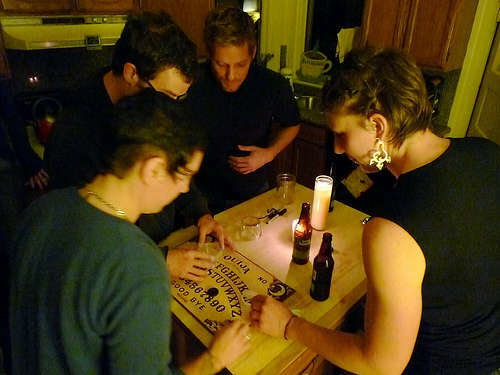 Witchcraft, voodoo, and black magic have been associated with the Ouija board by critics. The truth of the matter is that the board, planchette, numbers, and letters are all about as mystical as the computer you’re using to read this right now. This scary game works because of subtle unconscious movements on the part of the people using the board. Whatever is guiding them is up to whatever they want to believe. But whatever you believe, the Ouija board can make for a cool, scary and fascinating time. Never use it at midnight. Never ask when you’re going to die. Never wear mismatched socks when using it. The superstitions are just superstitions, but they certainly make the game more interesting. If you really want to scare the pants off of your friends, be sure and bring up some superstitions you know will get them a little worried. After all, despite knowing that there’s nothing supernatural going on, once you start using the Ouija board you stop remembering that it’s just a game. Remember that it is your own belief powering the board. The less you joke around the better your results. Be serious and respectful and the Ouija game will give you a night you’ll never forget.